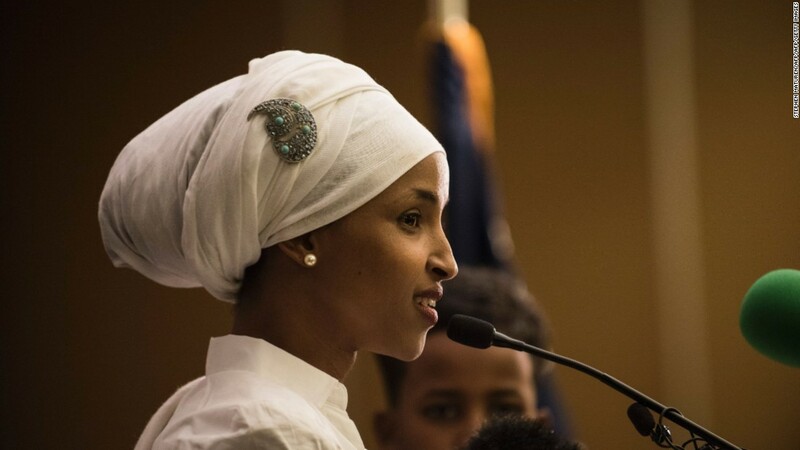 After a stormy start to her term in the House, by the controversy over her comments about the influence of pro-Israel donors have on some lawmakers, Omar had kept a low-profile for the past month. But the 37-year-old Somali immigrant, one of the first two Muslim women to serve in Congress, emerged this week with a tweet calling one of Trump's top White House aides, Stephen Miller, a "white nationalist." "The fact that he still has influence on policy and political appointments is an outrage," she wrote. Outrage has a way of following Omar, who received a death threat last month at her Capitol Hill office. Her latest tweet prompted another round of outrage as Republicans denounced here for saying Miller, who is Jewish, is a white nationalist. The President's son Donald Trump Jr. tweeted Monday night that Omar had "no shame" and called her the "head of the Farrakhan Fan Club." One GOP strategist took to Fox Business Tuesday to accuse Omar or "assaulting Jews." To top it off, President Donald Trump tweeted a video clip of the segment . Omar showed no signs of backing off, responding to Trump's tweet by quoting her 6-year-old daughter : "Knock it off. You're the president." The point, Omar seemed to be making, is that she perhaps lacked a clear understanding of the full history of anti-Semitic views in the US. "Oftentimes when you are speaking you might not understand the historical context of the words that you might use and the child of pain it might incite for people," Omar told Colbert. "And so, in this process I am learning that everything is not simple as we think we might want to state it." While Republicans have trained on other Democratic freshmen congressmen, including Alexandria Ocasio-Cortez and Rashida Tlaib, they seem to have settled on Omar as their most potent weapon to use against Democrats. Last week, a political organization with ties to the GOP establishment launched a digital ad campaign highlighting those comments and urging Democrats to remove her from the Foreign Affairs Committee. The American Action Network, a nonprofit, does not disclose its donors, but its sister PAC, the Congressional Leadership Fund, includes among its top donors casino mogul Sheldon Adelson and his wife Miriam. The 30-second ads, backed by AAN's six-figure buy, are running online in at least four House districts by freshmen Democrats. They charge that Omar "keeps hurling anti-Semitic slurs" and includes images of a now-deleted tweet from 2012 in which she stated "Israel has hypnotized the world." The official Republican Party is focusing on Omar as well. On Monday, a spokeswoman for the National Republican Congressional Committee called Omar and Tlaib "bigots," and linked to the newly announced congressional candidate in Michigan. "Inspired by bigots like Ilhan Omar and Rashida Tlaib, socialist Jon Hoadley announced he will run for Congress in 2020," reads an NRCC blog post by spokeswoman Carly Atchison. Hoadley, who is running against longtime Republican incumbent Fred Upton in Michigan, worked last year alongside Omar on a progressive think tank project called America's Cabinet. "Ilhan Omar downplays terrorism AGAIN," read the RNC's email. Omar has even gotten on the radar or state-level Republicans. At a March event sponsored by the state GOP at the West Virginia state house, someone displayed a poster associating Omar with the Sept. 11 attacks. The West Virginia Republican party denounced the poster; an official at the state capitol who defended the ended up resigning here position. It's likely too early to determine whether the focus on Omar will benefit Republicans at the ballot box. Unlike Pelosi, who has been a nationally-known political figure for years, Omar is relatively new to the national scene. It's unclear what effect it will have on voters, whether she'll swing them away from Democrats or motivated Republican base voters. No national polling companies have asked about Omar or her recent controversial remarks about Israel. Support for Israel over the Palestinians among Americans has generally hovered around 60% for more than a decade, according to Gallup. What the GOP scrutiny on Omar does accomplish, however, is putting her fellow Democrats in a bind. Moderate Democrats have been forced to respond to these comments and the results have been awkward. Democratic New York Rep. Tom Suozzi, an on-air interview Tuesday with CNN's Brianna Keilar, struggled to avoid addressing Omar's tweet about Miller before admitting that type of rhetoric "makes it more difficult" to reach solutions on immigration. "We need to take The temperature down, "Suozzi pleaded. Efforts at House leaders such as Pelosi to curb Omar's taste for the polemic have only worked to temporarily take a Twitter feed. 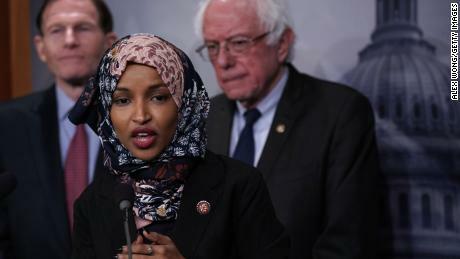 A House resolution in March denouncing anti-Semitism spearheaded by pro-Israel Democrats received pushback from progressive allies or Omar. Why, they asked, were their colleague being singled out when Republicans like Iowa Rep. Steve King and even the president had said worse things about immigrants? Under pressure, the language of the resolution was changed to include condemnation of all hate. Jewish and pro-Israel Democrats became upset the new resolution downplayed the seriousness of Omar's comments, and moderately democrats wondered why the caucus had been diverted from addressing the pocketbook issues they had run on. Michael Meehan, a Democratic strategist, called the scrutiny on Omar by Republicans "rubbish politics" and said he was skeptical it would hurt Democrats. "Clearly they're looking for another boogeyman," Meehan said of Republicans. If Omar intends to stop speaking out, either to deny Republicans the ammunition or to acquiesce to Democratic leadership's wishes, she shows no signs of doing so. She is notorized as a political asset, burnishing her credentials as a fearless speaker of truth to power. It's a role she seems to relish. After Vice President Mike Pence and Democratic majority leader Steny Hoyer made oblique criticisms of Omar in their speeches before the American Israel Public Affairs Committee conference late last month, CNN asked for comment. "It's been interesting to see such a powerful conference of people be so fearful of a freshman member of Congress, "Omar told CNN on March 26." I hope that they will not allow me to have a permanent residency in their heads. " CNN's Sunlen Serfaty contributed to this report.